Known as a "quick-change artist" among materials, vanadium dioxide (VO2) can switch from insulator to metal at the slightest provocation, accompanied by a near-simultaneous change in local molecular bonding. Controlling the phase change is another matter altogether. Dr. Richard Haglund, Professor of Physics at Vanderbilt University, presented his research on the remarkable phase transition properties of vanadium dioxide during his talk at the Frontiers in Chemical Physics and Analysis Seminar Series on February 3. This series, hosted by Pacific Northwest National Laboratory, features academic, government, and industrial leaders who discuss novel ideas and imaging advances. Vanadium oxides are under active development in many technologies that take advantage of phase change properties. Applications vary from chemical sensors, to optical "shutters" for heat sensitive window coatings and ultra-fast electrical switches. It's All About Phases: Persuade a material to change from one phase of matter to another, by subjecting it to a little heat or light, stress or a magnetic field and you have a material that's useful as a sensor. In one phase, it's an insulator, blocking electrical signals or transmitting light. In the next phase, it's a metal, facilitating current flow or turning reflective. By taking advantage of these electrical and optical properties a sensor is born. To understand and control that phase change, and tailor it to specific environmental inputs, are the next steps in the basic research and applications development of this unique material. Haglund presented his current research on the VO2 insulator-to-metallic phase transition using various techniques. "After ten years of research, we are just beginning to discover all the games you can play with this wonderful material," said Haglund. Heat as the Stimulant: Vanadium dioxide changes from a semiconducting to metallic phase at 70 degrees Centigrade (158° F). This characteristic is now being explored for "smart" window coatings, to change the window from transparent to reflective to control heat gain and loss. Haglund discussed his research on composites of VO2 and gold nanoparticles. The gold can be functionalized to bond with specific molecules, releasing heat to change the phase of the VO2 nanoparticles and enable sensing properties. Designing a sensor that would be carried by emergency responders to detect particular atmospheric chemicals is a possible use. Better control of triggering that phase change is the subject of ongoing research. If There Be Light: The VO2 phase transition can be triggered much faster by light than by heat. This optically induced phase change raises the inviting possibility of switching between the insulator and metallic phases at a rapid rate through the use of lasers. The optically induced forward transition is quite fast. The reverse rate is not as fast, and understanding that difference is an ongoing challenge. Haglund is studying ways to increase the reverse rate of transition to shorten the overall switching time. The ability to control the switching process with light triggers will have many photonic applications. "Slow turn-off time is a turn-off for people who want to develop applications," said Haglund. Size Dependency: The thermal phase transition of VO2 appears to depend on the size of the nanoparticle. This was unexpected and further study is ongoing to reveal the optimal size for specific processes. "This is an indication of some interesting things going on," said Haglund. "It depends on whether you have nice nanoparticles or not nice nanoparticles. Are they well-formed, or do they contain many structural defects?" Metamaterials: To understand and control the phase transition, Haglund's team is looking into patterned materials made up of metals and oxides, engineered to have specific properties not found in nature. Using a VO2 coated metal split-ring resonator, they are examining size-dependent phase change properties through the optical response of the metamaterial. The team is monitoring the size dependence of the phase transition by observing changes in the gold plasmon resonance while thermally cycling through the insulator-metal transition, warming and cooling. What's Next? Haglund's team is continually looking at ways to probe the unique properties of this molecular magician. "The research Richard presented is a fundamental exploration of optical and thermal phase transition in VO2. This material has applications in photonic devices, chemical sensors and catalysis," said Dr. Wayne Hess, who manages PNNL's Chemical Physics and Analysis group. "We are interested in the research overlaps with plasmonics and phase transformations as well." 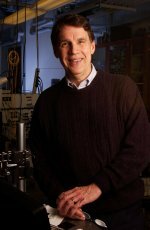 About Richard Haglund: A professor of Physics and former Chair of the Vanderbilt University Department of Physics and Astronomy, Haglund currently leads the condensed-matter and applied optical physics group. His ongoing research focuses on the dynamics of laser interactions with materials, and laser processing and analysis of materials. Haglund holds two patents in laser applications technologies and is author of numerous publications in peer-reviewed journals, conference papers, and book chapters.